2 Speckled Wood, 1 Meadow Brown. Very bright. Hottest day so far this year. Much earlier in the year I found some plants growing on the wall of the Steeple - an old lookout tower - but could only identify them down to a Speedwell of some kind. Yesterday I returned and found them to be Heath Speedwell (Veronica officinalis) - not a plant I would have associated with growing on old walls. Whilst I was photographing the Speedwell, I thought I would photograph the moss Grimmia pulvinata as well. On returning home I spotted another poser in the photograph..can you? 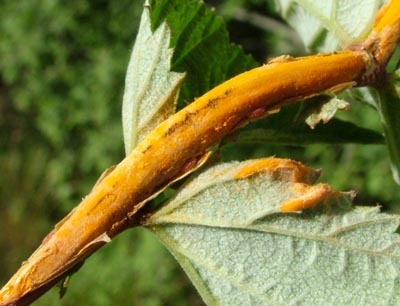 Talking about hidden creatures: I was photographing this rust on the Meadowsweet to show how much of the plant had been infected. On examining the picture more closely, I found these two larvae; presumably fly larvae of some kind. 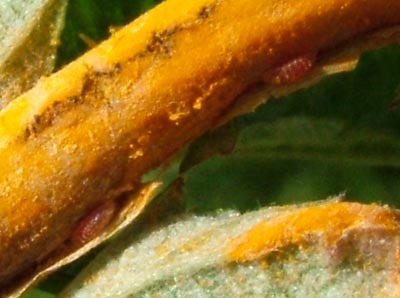 Don't know if they are feeding on the plant or the rust. 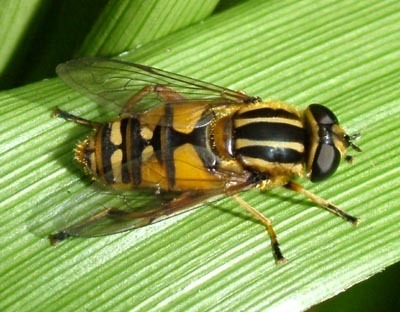 This hoverfly is Helophilus pendulus. It's normally very flighty, but this one was content to bask in the sun. Another photograph from the wall - Rock Stonecrop - Sedum forsterianum.